Why is My Vape So Harsh? If you’re new to vaping and yet to hone your ideal equipment and liquid combination, you may experience what is known as ‘harsh vape’. This is better described as the feeling of your vapour causing a harsh throat hit. 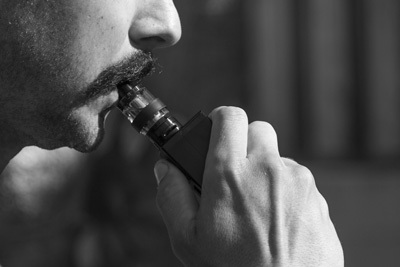 It is a common problem when you start vaping and we’ve listed the most common issues that can cause a harsh vape, and how to stop it from happening again. E-liquids come in a variety of strengths with differing nicotine content. You should consider which strength you need based on the number of normal cigarettes you would typically smoke in a day. 0mg - No nicotine - suitable for casual smokers. 3mg - suitable for light smokers who would smoke 1 or 2 cigarettes each day. 6mg - suitable for light smokers who would normally smoke a 20 pack a week. 12mg - suitable for average smokers who would normally smoke a 20 pack a day. 18mg - suitable for heavy smokers who would normally smoke more than 20 cigarettes a day. What is also important here is that the stronger the nicotine levels, the more of the throat hit you’re going to get every time you vape. If you’re finding your vape to harsh on your throat, try lowering the strength of your e-liquid and you should notice considerable improvement. E-Liquid comes in a variety of different mixes and some are only designed to be used with certain types of vaping devices. Simply explained, the PG gives you the throat hit, and the VG produces the vapour. Normal starter kits will work well with a 50/50 mix, producing ample vapour but also giving you that hit you crave when you have a cigarette. It can then scale either way, but typically more advanced devices with higher wattages work better with higher VG liquid . This is because they are designed to help produce more vapour, but with that comes more nicotine in each draw because the volume of vapour increases. If you’re using a more powerful e-cigarette, you should be toning down your nicotine strength to 6mg, or ideally 3mg, whichever you are more comfortable with. The higher the strength, the harsher the hit. You can also try higher VG liquids in more basic e-cigarettes but just make sure that it’s compatible to prevent dry hits. Looking now specifically at equipment, if you are using a device which has variable wattage on it, it's possible that you have this set to high. The higher the wattage, the more vapour produced, and much like the nicotine strength, the harsher the hit you’re going to get. Many e-cigarettes now allow you to adjust the airflow in the device to help control how much vapour the device produces. Whilst a useful feature, having the airflow closed too much will mean you’re inhaling a more concentrated vapour which could cause a harsh hit. Try opening your airflow more and see if this helps. It’s all about creating the experience you’re looking for when vaping and working out which liquid and vaping devices work best for your needs. Making the adjustments we have noted above should help improve your day to say vaping.